Mango madness is right. Or as multiple readers, commenters, and tweeters have put it: "Mango is the new pumpkin." Just as TJ's blasts us with pumpkin and pumpkin spice products each fall, they have utterly overwhelmed us with mango products for this spring/summer season. 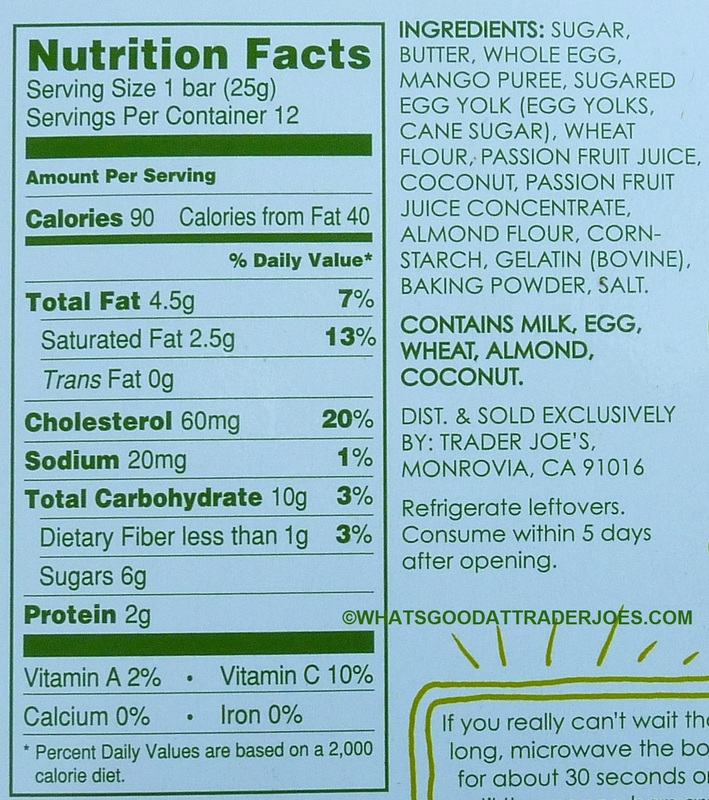 Pumpkins and mangoes are both orange, they're both fruits (technically), and Trader Joe is apparently madly in love with both of them. My head is literally spinning right now from all the new mango products. Okay, not literally. That would mean it's time to call an exorcist. But what I really need is a good personal trainer to help me work off all these mango products, which, unfortunately for me and my summer beach bod (or lack thereof), are mostly—but not exclusively—treat-ish, dessert-esque indulgences. As of the time of publishing this review, I've tried exactly three of these new mango products. One exceeded my expectations, one fell short of them, and this one was somewhere in the middle. 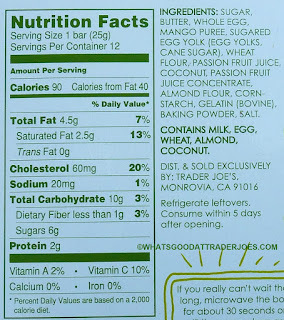 I think I might have been more impressed if not for two little factors here—the first being Trader Joe's Lemon Bars. They're essentially the same product, but lemon flavored. Not sure why they added the "bites" to this product name, because they're exactly the same size and shape. In fact, they're very similar in every other way. They even have the same type of packaging, the same preparation process, and the same fonts on the box. But the Lemon Bars are lemon...in case you hadn't figured that out by now. And I love me some lemon. And they nailed that sweet, tangy lemon dessert flavor pretty darn well. Likewise, these bars taste like actual mango fruit, but in a sugary, desserty, confectionized form. Really nothing to complain about. I guess I just like lemon more than I like mango. But these bars have the same soft, supple, creamy texture, and a nice sweet, mangoey finish. I'm certain mango fans will love them. The second thing that kept me from absolutely adoring these bars was the lack of coconut shavings. I really liked what little was there. It added a lot to both the taste and texture, and I wouldn't have minded, like, maybe three or four times the amount that was actually included. It blended with the mango pretty well, and it added some substance to the bars. It made for a nice summery, tropical kind of feel, and I think even more of it might have enhanced that vibe even further. Sonia thinks they taste just as much like passionfruit juice as they do mango, and for her, that's a good thing. I'm not sure if I agree with that or not. 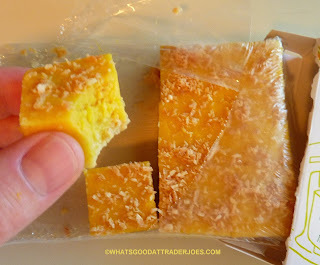 But we do both agree that these mango bars are good overall, just not as good as the lemon bars. 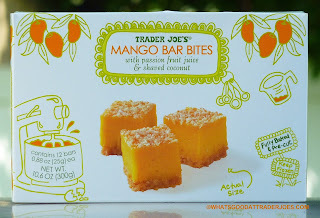 All in all, these are a nice refreshing dessert with a good balance of actual mango flavor and sweetness. We'll go with double three and a half's again. I hope that next madness is peppermint or mint for the holiday season. I think these bars would be a great for a tea party or a picnic. Gelatin makes it a no-go for me. Oh well. 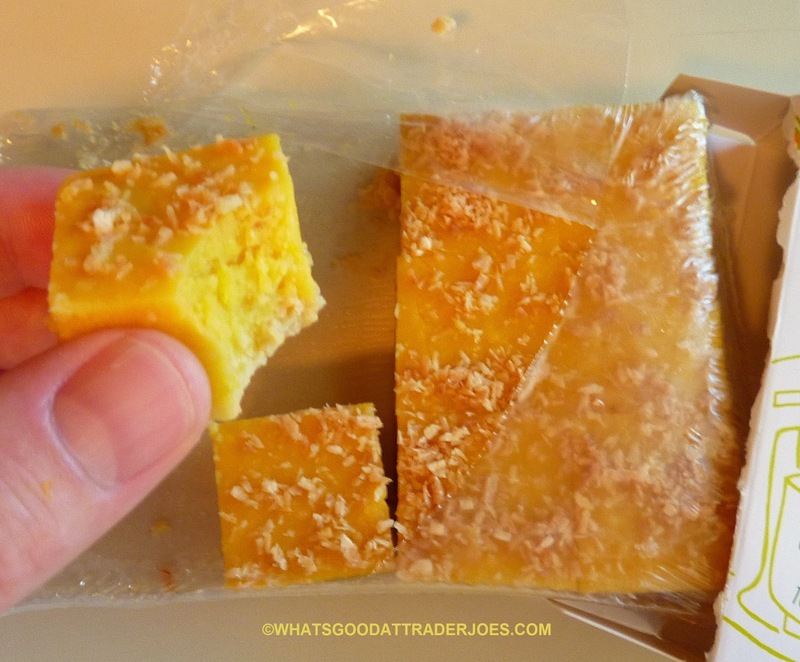 Did you happen to remember if the lemon bars had gelatin? Ah, I'm guessing you're vegan and/or kosher...? Yes, unfortunately, I'm pretty sure the lemon bars had gelatin as well. Vegetarian...it's always a bummer when something has gelatin in it 2 hen it probably isn't necessary. I'm looking at you Planters sunflower seeds, Pop Tarts and Frosted Mini Wheats! ^...when it probably isn't necessary." The new mango mango mochi are vegan! (And delicious) and the new marshmellows are vegan too- no gelatin! Which other mango products did you try and which one was above and which one was below expectations? Yeah most of these products are very sweet, although the mango and cream ice cream is weirdly NOT sweet if you ask me...you might appreciate that if you're looking for less sweetness, although it is very mango-ish still.